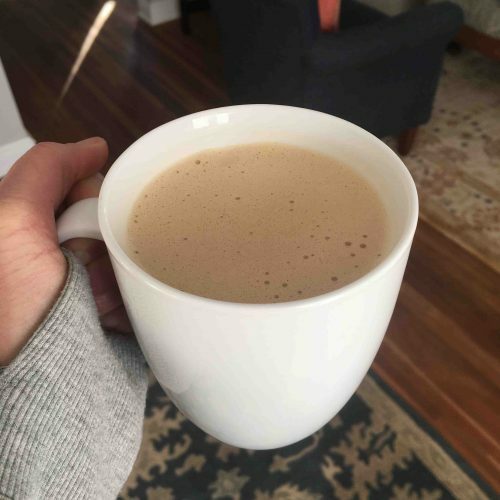 This fat bomb of a coffee drink can help you to stay in fat-burning mode, avoid carb cravings, and give you a hefty dose of brain-fueling healthy fats. I tend to mix up how I made my version so like most of my recipes this isn’t an exact science. If you’re new to the fatty coffee game, start on the low side with the fats, maybe a teaspoon of each. Make sure you use a blender for this! Mixing with a spoon or whisk is going to leave you with blobs of fat floating on top. ew. If using hemp seeds, add all ingredients except the collagen/gelatin to a blender and blend on high for 1 minute. Add the collagen or gelatin and blend for another 10 seconds or so. If not using hemp, add all ingredients and blend on high for 10-15 seconds. Pour in your favorite cozy mug and enjoy! Like I said, I switch up which types and how much of each fat I put in mine. Sometimes it’s just coconut oil and ghee. Sometimes just ghee and cacao butter. Sometimes mct oil and two of the others. Just depends what I have and what I’m feeling! I usually end up with about 2 tbsp of fat. But again, if this is new for you, start with less! *When blended for enough time the hemp seeds impart a delicious creaminess and slight thickness that add to the warm hugginess (sure, that’s a word) of this breakfast (or anytime) drink! What’s the difference between met oil & coconut oil? coconut oil has MCTs (medium chain triglycerides) in it but they only make up about 55-65% of the fatty acids. MCT oil is 100% MCTs (though there are different kinds of mcts within that). MCTs are beneficial because they are digested easily and are sent directly to the liver to be metabolized and are turned into ketones, which can have a positive impact on metabolism. Because of that, they don’t need bile or pancreatic enzymes to break them down which is helpful for folks without gallbladders or anyone with impaired digestion. They also can promote a healthy gut because they have antioxidant and anti-inflammatory properties.